So for today’s post I thought I would share my handbag must haves. If you have followed my blog for a while you will know I adore handbags and love switching and changing my handbags. The contents stay the same most of the time as I feel I know what I need in my handbag for a day to day basis – I mean I carry more than I probably need to but I like to know I have everything in my handbag just in case. I have only shown a few things on this post but these are definitely the essentials for my handbag in my opinion. So first up is my little tea bag holder which I picked up from Ebay for under £5 I’m trying to get into flavoured tea more to cut down on milk and sugar in my drinks and thought this would be perfect for my handbag to keep them all in one place but I can then keep a few different ones in case I want to try something different. I love it! Next up is of course a make-up bag with my essentials inside which this make-up bag is by the brand Maggs London and I just love this make-up bag as it fits everything I need inside it. My essentials are pretty standard just a powder brush, my Collection powder, The Body Shops Vanilla Chai hand cream which I adore this sent so much. I also carry the Bath & Body works hand sanitiser which when I was taking these pictures I was using Egghausted with it being Easter but I’m now using Hands Off My Honey which I love the scent of this. Next up is my new Kindle I got recently and it’s honestly got me back into reading so much I’m loving it again! I have one of the magnetic cases as it’s nice and compact so it fits in any of my handbags and it’s so light. My last thing is more of an obvious one but it’s definitely my purse as I’m always shopping or buying something, I was using this white purse from River Island but I’ll be completely honest within a few days of having this purse it started to stain and didn’t look as nice as it does in this picture so I had to chuck that away and purchase a new one. 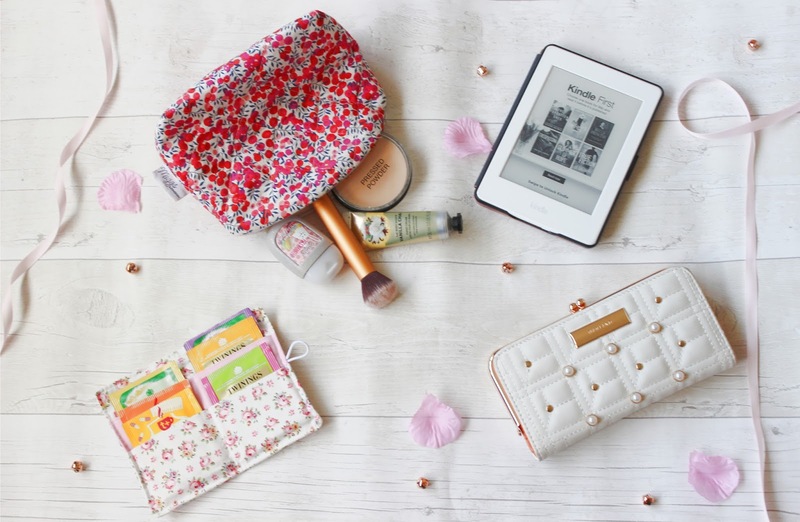 A few other essentials are my phone charger, some tablets in case I have a head ache or anything like that but I do try to keep my handbag as simple and as organised as I can so I know where everything is inside my handbag and it’s all in one place. What is your handbag essentials? Great post, I love having a nose in what other people keep in their handbags. It gives me inspiration and reminds me of items I may have missed. I love the tea bag holder? I don't suppose you have a link to the seller? ?